Steel X-plosion is categorized as Steel Drum Band as well as Calypso Band, Caribbean/Island Music, Funk Band, Jazz Band, Latin Band, Reggae Band, and Soul Band in Brooklyn, New York. Steel X-plosion is available for hire within the New York City (NYC), New York area and beyond. STEEL PAN - KEYBOARD - PERCUSSION / 1980 - Born in New York City and moved with his parents to Trinidad & Tobago that same year / Received early musical training from his well-known Trinidadian father Freddie Harris Jr., a guitarist for Harry Belafonte, who also toured with Hugh Masekela, Miriam Makeba and Ashford & Simpson. Began playing steel pan at the age of four / At age six moved to St. Thomas, Virgin Islands, and began playing with The Rising Stars Steel Orchestra / 1990 - returned to the States and continued to develop his musical skills / 1998 - graduated as valedictorian from New York City Repertory Company High School / 1998 - received a scholarship from Something Positive, Inc., to attend Florida Memorial College (FMS). At FMS he co-arranged under the direction of Dr. Dawn K. Batson, Director of the FMS Steel Orchestra / 2003 - received a B.A. with honors in Music and a concentration in Jazz Studies / 2001 - released his first CD, "The Universal Journey" / Performed in NY City with noted Jazz performer Bill Saxon and world-renowned percussionist, Leopaldo Fleming, and throughout Florida and U.S. with the FMS Ambassadors Chorale. Performed and toured throughout the Caribbean as Ambassador for FMS and participated in many competitions / 2002 - Won 2nd Place in the Trinidad & Tobago World Steel Orchestra Classics solo competition with his rendition of the jazz/classical composition Misty / Appeared on several Hispanic TV shows in Miami, Florida. Currently employed as the arranger for the Sesame Flyers Int?l (Brooklyn) steel orchestra / 2002 - performed for former-President Bill Clinton at the South Beach, Florida Speech for Youths / 2003 - performed for the NAACP 94th Annual Convention Gospel Extravaganza, opening for Pastor Donnie McClurkin at the Jackie Gleason Theater of the Performing Arts in Miami / 2000-03 - performed for the Melton Mustafa Jazz Festival. 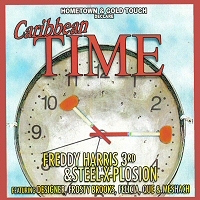 Freddy plays many musical styles, from R&B, Jazz, Calypso, Soca, Latin and Reggae, to Hip Hop, Gospel, Pop, Blues, Country, Western and Classical.